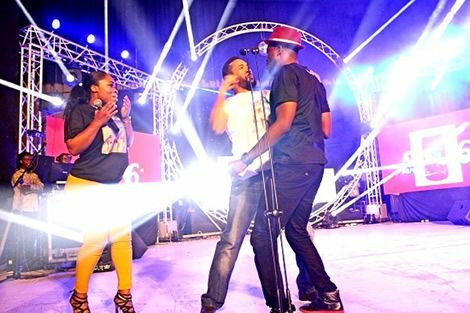 VIDEO: Majid Punches Kalybos on stage! Actors Majid Michel and Kalybos took their acting on stage during the 2016 Ghana DJ Awards over the weekend. The “Amakye and Dede” stars thrilled audience at the event as they stepped on stage present an award. Kalybos together with actress Moesha Boduong came on stage to present an award at the ceremony, Kalybos upon seeing and appreciating the curvy nature of the beautiful actress said he will choose her over Ahuofe Patri, suddenly Majid dashes on stage only to punch Kalybos in the face. The two actors also danced to Abrantie Amakye Dede’s song on stage after their fight over Moesha Boduong. The act incorporated in their presentation added more fun and excitement to the award ceremony. They also ceased the opportunity to announce the premier of their latest movie Amakye and Dede slated for 26th of March at the Westhills mall.